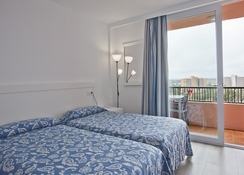 HYB Eurocalas by Garden Hotels by Garden Hotels in Calas de Mallorca is a family-friendly apartment hotel nestled between the Mallorca coast and thick foliage. Few minutes away from the sun-kissed beach of Cala Antena, this luxury aparthotel has all comfortable amenities for guests to enjoy their fun-filled holiday in Mallorca’s lovely Mediterranean weather. With kid’s pools, water slides, playground, kid’s club and engaging entertainment programs for children, this property is a firm favourite of families with young kids. Spread over five majestic building, and packed with excellent amenities, it’s truly a traveler’s delight. Hop on the mini train to reach any of the sunny bays or walk along the cliff if your fitness permits you, there’s plenty to do in sunny Calas de Mallorca. This property is just 10 minute’s walk to the beach, but buses ply to the beaches of Cala Antena and Cala Comongos. Supermarkets, disco, bars and restaurants, taxi stands, bus stops, tourist information, shops and city centre are all a short walk away. Nearby towns are Felanitx (16 km), Porto Cristo (14 km) and Manacor (19 km). The nearest airports are Palma de Mallorca Airport (47.5 km) and Menorca Airport (92.1 km). The 12-storey hotel has 397 guestrooms spread over 5 buildings with a lift. The rooms could be either apartments or guestrooms. The rooms come furnished with air-conditioning, satellite TV, phone (at extra charge), private bathroom, a mini fridge, a safety deposit box and balcony. The hotel’s main buffet restaurant serves international cuisine in all major meals of the day. The bar is for drinks, snacks and ice creams. There is also a wide range of activities for all ages at the complex. The breakfast buffet is sumptuous. A snack bar is available for light bites throughout the day. Outdoor sports like basketball, volleyball, tennis and aerobics and indoor entertainment such as game room, darts, animation programmes, billiards, archery and table tennis are available the hotel. For golf enthusiasts, a golf course is 10 km away. Four fresh water swimming pools with sunshades and loungers including one for kids, exciting evening shows, a theatre and TV lounge are other facilities for guests. During the works of refurbishment (November – February) hotel will remain closed. Hotel will open for summer 2018 according the dates stipulated in the contracts. For summer 2018 will be a 4**** hotel. Breakfast, lunch and dinner in Buffet style with a wide variety of international cuisine. Drinks such as; soft drinks, beer, wine, juice, water, coffee, tea...". Located next to the main pool, from 10:30 to 18:00h, snacks buffet as well as ice creams and beverages: Sodas, slush, beer, juice, water, coffee and, tea. From 10:00 to 23:30 (last order). Cocktails menu, soft drinks, slush drinks, beer, local alcoholic beverages, juices, water, coffee, tea. 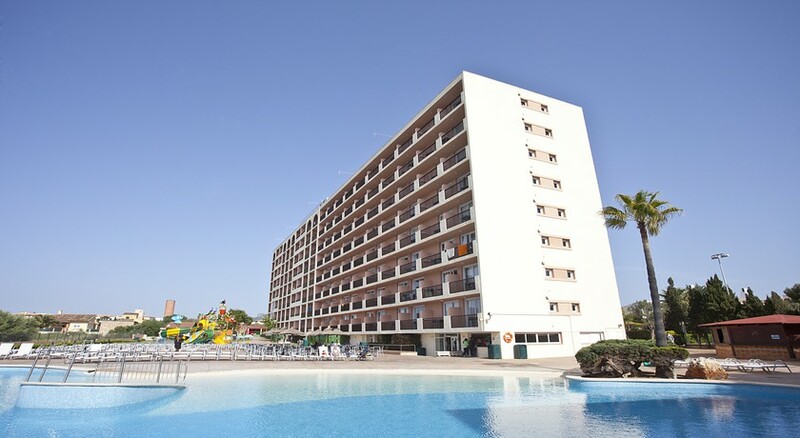 Use of swimming pools, deckchairs, slides, Tennis/Football/Basketball/Voleyball/Petanque court, table-tennis, Mini Club of the Hotel, playground for children. Entertainment for adults and children with a wide variety of activities such as; Tennis, volleyball, football, basketball, table-tennis, Mini Club, Mini Disco, Yoga, Taichi, Zumba, Waterpolo, Darts, Riffle, Cocktail game, Archery, Detox juices tasting. Professional shows nights. Wifi corner free at the Bar. Kettle service in all the rooms. Import Beverages or first brands: In that case there is a supplement for A.I. customers, as indicated in the price list or exposed in the bar or restaurant. Invitations to other people who are not staying in the hotel must be paid. Arcade zone, works with € coins. Kid Karts works with € coins. Balinese beds with cava and fruit service, Aquatic balls in the pool, Food trucks in the Bar terrace, Ponys 2 days a week. Rentals: safe, wifi in the rooms, iron, laundry service, bicycles, baby buggy, cars, excursions. Note: It is not allowed to get food or drink out of the restaurant for hygienic sanitary reasons. Very busy place- restaurant a bit chaotic at times. Room was perfectly adequate but the bathroom was exceptionally small and badly laid out. Facilities were good for kids and overall a good holiday and good value for what we paid. Me and My 5 year old daughter stayed in this Hotel this year September. It was her first holiday. I dont have a bad word to say everything was brilliant and should be classed as a 5 Star! We really enjoyed our stay here, great clean hotel with lovely friendly and helpful staff in every area. Plenty of great choice for food, including vegetarian options, and plenty for the kids to do. Recommended. Fab pools, good food, clean spacious rooms, friendly staff, fab bar staff and they did give us more than one drink at a time. Would definitely go back. Stayed here in May 2017. Would go back.